Beat The Timekeeper without taking a single hit last night. Got dunked on by The Hand on the same run due to a couple dumb hits. Got to the Hand twice this week by maxing brutality with grenades, but never beat him. Finally got him tonight with the cheesiest strategy, double Wings of the Crow, activating one as soon as the other expires. I finally beat the highest difficulty mode, after being stuck on it for a while. You can get up to some crazy high damage numbers. In this run I think I grabbed seven cursed chests, but by choosing a different biome (that I find too risky) I could've gotten two more. In combination with an S-rank weapon in my last slot, and a challenge portal I ignored, that means I could've had almost double the damage I did. Anyway, in 4-cell mode they take away almost all your healing and every enemy hit fills up your malaise bar, which effectively becomes your real health bar. It's a bit much to be honest. Even most of the food you find increases your malaise if you eat it. I appreciate the graphic. 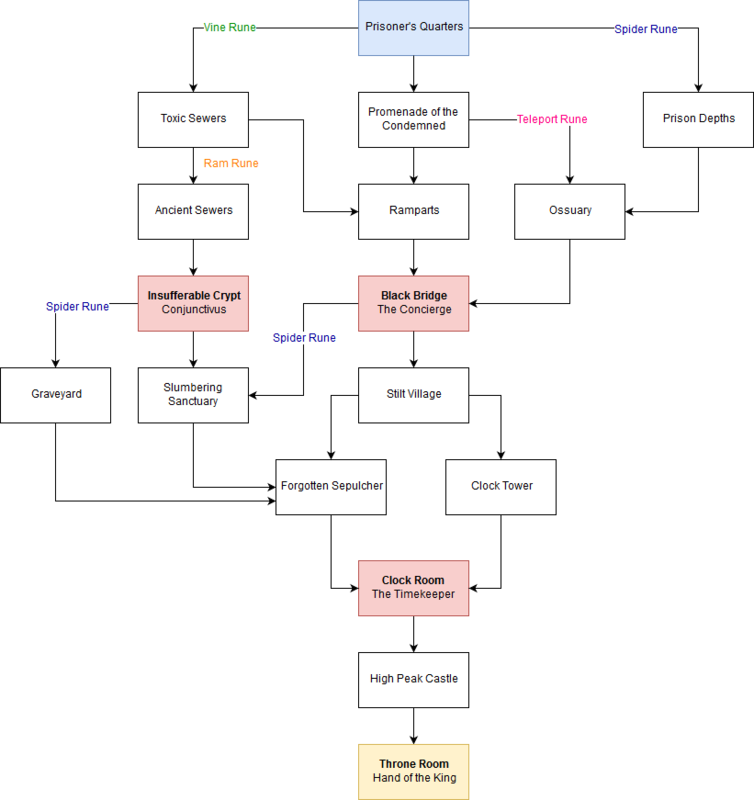 The list on the wiki was always confusing to me, especially a couple of the spider rune routes didn't make sense. Glad the visual layout helps you out too. I finally got the spider rune this morning, then made it to the Time Keeper for I think the fourth time. I had accepted death, but actually did really well for the first half of the fight. Was dialed in, dodging and keeping pace with her. Then the second half started and I fell apart for no reason at all. Oh well. Maybe I'll get her next time. I'll miss that awesome bow I had though. Mr. Dragon keeps casually walking in front of the screen, because he's not used to me "playing intense games," if that gives you any idea of our relative skill levels. I didnt realize all paths had the same total length. Sometimes it felt like going in certain directions always let me end up with more level ups than others. Maybe thats still true and down to the length of the level and number of possible level up scrolls. Thanks for sharing the map! I still havent beat the game, I've fought the final boss about 4 times and no wins. There is one missing link from Promenade to the Prison Depths, via the Spider Rune, that makes it a 10-biome run instead of 9. For a few extra scrolls, I'll go Prison->Promenade->Prison Depths->Ossuary->Black Bridge->Stilt Village->Clock Tower->Clock Room->Castle->Hand. Ah, thanks for pointing that out! I forgot to mention that I was building this as we played through, not wanting to spoil anything. Mr. Dragon had mentioned that route existing but I forgot to map it. I actually started the map because I was curious if the path lengths all balanced and which biomes were on the same level. This has been a really slow burn for me. 1, maybe 2 runs a night. I just made it to conjunctivitis tonight for the first time (and beat him. Ice bow + heavy crossbow made it pretty easy with a couple deployables. One day I'll find the spider rune and get better at the game, but I'm mostly happy with my run. I made a lot of mistakes in the last biome, being new to me and all. From the Prisoner’s Quarters, head to the Toxic Sewers (using the Vine Rune) and then into the Ancient Sewers (using the Ram Rune), then from the Ancient Sewers to the Insufferable Crypt. The Insufferable Crypt houses a tricky boss fight with a giant eye creature. Defeat it, and you’ll be able to head into the Slumbering Sanctuary. The Slumbering Sanctuary is a beast of a zone and will require constant vigilance. Go slow and keep an eye out for your target. The elite holding the Spider Rune is at the bottom of a pit marked with a skull flag, so drop down and do your best to survive. Finally picked this up for Xbox from the recent sale and am falling down the rabbit hole. What a game!! How do I activate custom mode? Where in the regular game does this unlock? Aside from all the new custom mode, some nice little changes like moving the timed doors to between levels, so you can actually use what you gain. And apparently a lot of weapon and skill balance changes. Should be interesting. Might jump back in for a bit. I finally beat the highest difficulty mode, after being stuck on it for a while. Nice work! I'm pretty ready to give up on nightmare difficulty. The malaise mechanic is just too much. Oh good, I can set the game to have everything unlocked. I'm more of a fan of traditional roguelikes where you're overwhelmed by all the weapons, armor, items, etc., you can get and every run is substantially different. The act of unlocking things in a lot of roguelikes feels like busy work to me (see: Gungeon) though some do it right by having a metric ton already available (see: Isaac). Beat Conjunctivius with no hits and The Hand with no hits and The Cursed Sword today. Only trophies I have left are for the higher difficulties. Have heard that dual Ice Shards with dual Oil Grenades is insanely overpowered at the moment, so have to play with that, as soon as I actually unlock Oil Grenades. Still haven't unlocked oil grenades yet, but Oiled Sword bound to the same button as Ice Shards is like a super shotgun. Normally, I'd take about 5 minutes carefully clearing out this chunk of the castle. It's hilarious. Wife said it was time for bed, so I was gonna stop for the night after the Stilt Village. 15 minutes later, I'd burned through every enemy up through The Hand like they were nothing. And I mean clearing every level thoroughly. but Oiled Sword bound to the same button as Ice Shards is like a super shotgun. Wait, what, you can bind more than one thing to a single button? Why have I been spamming both triggers like a chump this whole time? Yeah, I first saw it in this video, where he runs dual Boomerangs on 4BC. Getting the Oil Grenade from a Hammer in the Prison Depths was more of a challenge than I thought. Kept dying, but closed the app and restarted the game/level, and since the seed was the same, the same one dropped it, and I could run for the Ossuary exit. Was especially lucky, because I'd accidentally blown the Hunter's Grenade/Blueprint Extractor on one of those warping knights with the Cloud sword from FF7 in the Promenade. They weren't kidding about Dual Ice Shards/Dual Oil Grenades. As slow as the Ice Shards are normally, when you have two, particularly on the same button, it's like a softball machine gun with no cooldown time. Seemed like when I ran Oiled Sword/Ice Shards, it'd fire twice, then stop for a few seconds. Now it's like a high-speed snowball fight. The Oil Grenade seems to have a radius of about 3 screens, and aside from one of those wooden dummies shielding enemies in the Promenade, I just ran through beaning everyone and killing them before they could see me. This is way OP, and I can definitely see it working if you can survive long enough in 1BC+ to get two shards and at least one grenade. EDIT: No sound, because I was doing remote play during a work deployment, but here's me wiping the Timekeeper in 5 seconds with no damage using this build. Beat the hand at 40:06, which is my fastest run ever. Got my second boss cell just now. Video sharing app crashed when I was trying to trim the video of this build beating the Timekeeper on 1BC in literally 2 seconds. Corrupted Power, Phaser to get behind her, 6 boomerangs with one button, dead. Was doing dual Ice Shards with an Oil Grenade and Phaser. Got a Legendary Pyrotechnics drop in the High Castle that had 200% damage given/taken, and I figured I was dead in a few hits anyway, so why not, since it was effectively the same synergy as Ice Shards, only with burning instead of slowdown, and it auto-targets enemies. 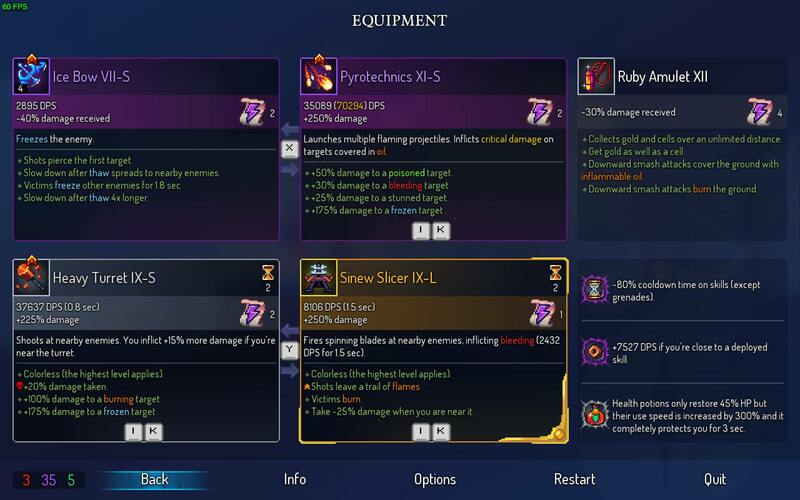 Re-rolled it to only 120% damage, but it feels much slower than Ice Shards. First time actually getting to The Hand on 2BC. Savescumming really helps. Died to him twice, nailed him the third time, without having to waste an hour between each run. Before each cursed chest, I'd exit to the menu, go into the PS4 settings, and back my save up to the cloud and USB. If you die, hold the PS4 button, close application, and restart, and if you got it before it starts loading up the Prison, you should be able to continue. If not, copy your save back over and try again from the same spot. Made 2BC a breeze. Gonna grind for about 483 more cells to get my 4th flask refill, since there are no refills at all in 3BC. Overall, though, it's just finding a good build, getting lucky with scrolls, and abusing the spirit of the game by reloading if you screw up. 3BC is down. One more til Platinum. What you don't see here is that the entire game was a breeze because an Elite in the Promenade of the Condemned dropped an amulet that turned me invisible after 5 seconds. Literally just scouted out entire levels, picked up scrolls and cursed chests, did my save bit, then picked off lone enemies to wear off the curses, until I was ready to do the usual steamroll with Ice Shards/Oil Grenades. The mutation that gives you health for kills was a lifesaver. Started the Forgotten Sepulcher with like 5% health, didn't even need to use a flask, and was at 100% by the end. Think I used the flask twice the entire game. Didn't even have to retry on the Hand. Just beat 4BC for the Platinum! Grabbed an Ice Shard that did almost 300k crit damage (4x damage given/taken) right before the Timekeeper. Definitely a good pickup. Went full tactics, cleared out every inch of every level. Surprisingly no cursed chests in the Castle on 4BC. New player here. I’ve beaten the first boss a couple of times but can’t seem to get much further than that. At what point do they let you pick your weapons at the start? So far I start with a bad sword and my choice of a wooden shield (what is the point of that? It doesn’t seem to do anything) and a random bow. I keep finding blueprints, but after I buy them I get one of the weapons from them and never see them again. Is that how it’s supposed to work? Short answer DT - just keep playing. All will become clear in time.